One of the Lianhe Zaobao’s picks for its “Books of 2016”, Chou Sing Chu Foundation’s latest book about 50 bookstores compels active remembrance, helping memory and history to come alive. Singapore’s bookstore industry has a rich history that can be traced back to the late 19th century. Yet, in a city of rapid development, much of this history remains invisible in the urban landscape. 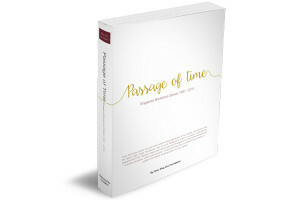 Passage of Time was published by Chou Sing Chu Foundation as part of its efforts to document and preserve this history. Primarily detailing the histories of 50 bookstores in Singapore, it spans different eras, from the age of the five major Chinese bookstores to the development of local textbooks to the decline of the local bookstore industry and the emergence of independent bookstores, Passage of Time offers a historical picture of literature, culture and education in Singapore. The bookstores featured include pioneering giants such as MPH and The Commercial Press to contemporary players like BooksActually. These stories range from the intimate to the expansive, taking readers to the quiet space of Xinhua Cultural Enterprises one moment and through the decades-long history of the World Book Company the next. Among them are the tales of several bookstores that have contributed to social causes including education, feminism and intercultural understanding. Further, these stories upend the common perception that the early days of Singapore’s bookstore industry were dominated by Chinese bookstores. The pioneering bookstores featured include Kelly & Walsh – Singapore’s first bookstore, selling English books – and Kedai Haji Hashim – the first local Malay bookstore. Each story is exhaustively researched. Similarly, many subsections in the book begin with a detailed map, meticulously put together, showing a particular area or neighbourhood in Singapore and an accompanying list of bookstores, grounding each name in a physical location. Near the end of the book, there is even an extensive list of hundreds of bookstores, old and new. However, despite the vast amount of research, Passage of Time also reveals the irrecoverable gaps in the history of Singapore’s bookstore industry. While an enormous undertaking, the stories still only encompass the histories of 50 bookstores. On the other hand, the maps are stylised, rendered somewhat impressionistically, giving a sense of these places but limited in specificity. More pointedly, the list of bookstores makes plain the names and addresses that have become lost to time. The traces that these bookstores have left across our cultural history are much like writing: sometimes clearly visible, sometimes fading, sometimes on the verge of being erased. Passage of Time may not provide every fact and detail – an impossible task – but it offers something invaluable. Its presentation of the history of Singapore’s bookstore industry exceeds the facts and information, appealing directly to the personal memories of the reader. In a section near the end of the book, a number of contributing writers from different walks of life recount their memories of bookstores. Perhaps this is how its Chinese title – meaning “to the reader” or “to readers” – achieves its full resonance. After all, every one of these contributors is also a reader. Indeed, many of the stories in Passage of Time reflect a personal angle, on the part of readers, writers and bookstore owners. Each story, each list, each address and each name triggers personal recollections, and serves as a starting point from which to understand larger narratives of history, politics and culture. Beyond the facts and figures collected within, the book emphasises personal memory, suggesting that the passage of time continues in each moment, as it finds its readers and connects them to these anecdotes, historical facts, and individual memories. This should not be surprising, for it is only through active remembrance that memory and history truly come alive. More than a book about bookstores, Passage of Time celebrates the individuals: owners, writers, educators, editors and readers. Bookstore Chronicle: The 135 years of Singapore’s bookstore industry are divided into four distinct periods, namely, The Pioneer Era (1881-1920), The Era of Localism (1921-1950), The Golden Era (1951-1970), and The Modern Era (1971-2016). Bookstore Memories: Prominent figures, both local and international, from different walks of life were invited to share their stories of visiting bookstores and reading. Bookstore Listing: An extensive list of approximately 500 bookstores that have staked their presence in Singapore through the years. Although we have made every effort to ensure the completeness of the information, practical limitations like a lack of archival information means that this list is by no means exhaustive. This book is Chou Sing Chu Foundation’s contribution to a better understanding of the Singapore bookstore industry. We dedicate this memorandum to all readers, in the hope that we never lose the feeling of picking up a book and taking our first steps into the forest of reading. For school or bulk purchases, please email to sales@chouscfoundation.org. Available at major POPULAR Bookstores, Books Kinokuniya and other bookstores.